With the best carpenter’s tools belt, you will not only always have the tools you need nearby but it also makes it easy to organize them. And so a tool belt not only helps you carry tools around when working but also improves worksite efficiency and minimizes time wastage. However, when you start shopping for a tool belt you will be amazed by the myriad of options available in the market. If you are not keen enough you can end up wasting your hard earned bucks on something substandard. But, this should never be the case with this guide to help you out as we explain in detail how to choose the best one and also review 5 top-rated carpenters’ tool belts to give you some recommendations. The Occidental Leather 9855 is a super comfortable tool belt designed for the production carpenters, and it features an adjust-to-fit design that will help ensure you always get a custom fit. Its fat lip pockets are designed to stay open for easy tool access. This tool belt has a 10-inch wide main tool bag and several medium-sized and smaller ones to accommodate all your tools. Also, the pockets are designed to be deep enough and made with industrial nylon that is leather-reinforced for maximum durability. With its handmade construction this tool belt has an appealing and authentic look and besides the multiple tool holders, it also includes a special holder for a hammer at the rear. And with the pre-installed D-rings, you can easily use it with a suspension system. Although there are no handles of this belt, it should still be quite easy to wear and remove and handling it should also not take a lot of effort. With a variety of size options, the Gatorback B145 is designed to suit the needs of all kinds of carpenters. 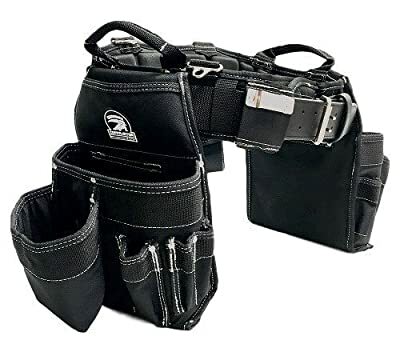 It is a well-made tool belt that features riveted and bar-tacked stress points to make it tougher and more durable, and with lots of pockets to accommodate all your tools. There are a total of 3 pouches which include a large 7 pocket one, a hammer holster and handy clip for your tape measure. The heavy-duty DuraTek nylon construction ensures you can be confident that this tool belt is not only highly durable but also lightweight enough. And with the unique ventilated padding on the belt, you can be sure of a sweat-free and comfortable experience. This tool belt comes with some wide and easy to access pockets that will make it easy to get to your tools but their most impressive element is the box shape that ensures they never sag. Other things that make this one of the best carpenter’s tool belt are the carry handles as they make it quick and easy to wear and remove and also effortless to carry around. For a carpenter on the market for a heavy-duty, durable and super comfortable tool belt, TradeGear has you covered with this top-quality one. It is a DuraTek 1250 fabric tool belt designed to be tough and durable and it also features some bar-tacked stitching and riveting on the stress points to make it even more durable. 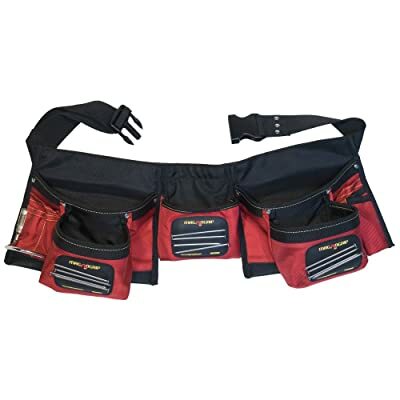 With this top-notch tool belt you will get a total of 15 pockets that come in varying sizes to accommodate different tools and 2 heavy-duty pouches for larger items. Also, there is a hammer loop, a couple of slots and one of the pockets is meant for a speed square. And there is also a ventilated high-density foam padding, contoured back support and unique air-channel ventilation for a sweat-free use. All the pockets on this tool belt are designed to offer easy tool access and with the included carry handles it should be easy to put on and remove or carry from one point to the other. When you want to save big and still get the best tool belt for carpenter’s, the MagnoGrip 203-017 will be a great choice as it is both high-quality and highly affordable. Its design includes some 12 pockets that are strategically placed in easy to access places to ensure you can get to all your tools with relative ease. And the pocket also includes some special ones with magnets for holding your nails, screws and other small metallic tools. The tool belt is made with double-layered polyester material to ensure many years of great service, and all the key stress points have been reinforced with rivets to provide extra strength. Also, the main pockets on the tool belt are designed to remain open when wearing it which means that getting your tools out will be quick and easy. Securing the belt on your waist is also made easy by the efficient buckle system, and the belt is also designed to be easily adjustable to fit almost any carpenter as it comes in a one size fits all. The belt is relatively smaller which makes it lighter and easier to handle and although it does not have enough space for long handle tools, it should still accommodate most typical carpentry tools. Although everything about this tool belt is just amazing, what many carpenters will love most about Dewalt’s DG5650 is that it has an impressive 31 pockets. With such a high number of pockets that are all strategically placed, you can be confident of always having easy and quick access to all your tools. And they are designed in different sizes and shapes to accommodate different types of tools and with some large ones with a gusset style for extra capacity and simple access. This 6-inch belt is also heavily padded to ensure maximum comfort and with a Dri-lex liner to keep you sweat-free, and a double tongue roller buckle to make the belt easy to secure and stable. And there is also a unique pouch handle that will make this belt easy to adjust, allow for one hand carrying and also act as a convenient hook for hanging it in the workshop when not in use. For added security, pockets meant for valuables are zippered and there are also carabiners for keys and lanyard. This tool belt will fit any carpenter with a waist size of between 29 and 46 inches. Whether you are picking out your first carpenter’s tool belt or are a seasoned carpenter that wants to upgrade to something better, finding the perfect tool belt for you can be a daunting task. But, by considering the following points when shopping for the tool belt, things should be less tedious. Carpentry is a broad profession and hobby that incorporates various kinds of jobs or tasks that will require you to use different kinds of tools. And so as you are shopping for a tool belt, you need to first decide what tasks you will be using it for. Will you be marking furniture from the workshop or installing fixtures and structures? Different jobs will require you to carry different tools, and so the tool belt that you choose has to accommodate the specific tools you will need. When it comes to the tool belt design, you will need to watch out for things like the shape of the belt, the model’s hand orientation (left or right handed) and the arrangement of the pockets. The shape determines how convenient and comfortable it will be to wear while the hand orientation dictates the ease of accessing the tools. Also, a good design should include other things like a conveniently located hammer holder and loops for power tools. The material used to make the tool belt will determine everything from the comfort to durability. A good carpenter’s tool belt should have a sturdy material with a good stitching to ensure maximum durability. Also, the material should be lightweight and easy to clean. Some of the popular materials that meet most of these conditions are leather, canvas, nylon, and polyester. Because the tool belt has to carry heavy tools and hardware, it should be lightweight enough to ensure that it does not add any unnecessary weight. However, it should also not be too lightweight as this often indicates inferior build quality and material. To determine whether the weight is good or not, check how it feels when wearing it, and ensure it does not weigh you down. Also, a good belt should feel easy to lift when it is weighed down. Tool belt size is a crucial factor that should never be overlooked. And although the right size for you will ultimately depend on your preferences, there are certain things you need to watch out for. You should check the dimensions of the belt and make sure that it is not too large or small. Also, check the number of pockets on the tool belt and whether they have a zipper to keep tools secure and if they are detachable or not. A comfortable tool belt will ensure that you can work for extended periods while wearing it. Tool belts with a soft padding and a design that ensures maximum breathability are often the most comfortable. Also, for a tool belt to be comfortable, it has to fit well. When it comes to the durability a tough material with good stitching, high-quality hardware and rivets are some of the things to look for. It is always good to be able to adjust your belt for a snug and comfortable fit. An adjustable belt and buckle design is the best way to ensure this. And although most tool belts are adjustable, the ease of adjusting and effectiveness of adjusting them vary from one to the other. Hence, before you buy a tool belt, you need to make sure it is quick and easy to adjust. A warranty is what will give you some assurance that the belt will last longer and give you value for your cash. While most high-quality carpenter’s tool belt will have a warranty, the length will vary between brands. The best ones are those that have a long warranty but something with at least a 30-day money back guarantee should be good enough. 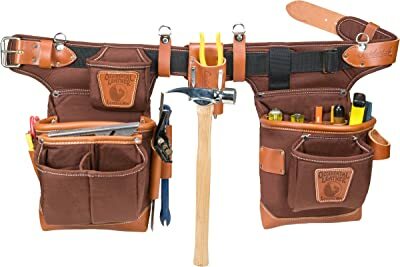 You can get a carpenter’s tool belt for as little as under $50 but some top quality ones from leading brands will retail for hundreds of dollars. When it comes to the price, you need to decide on how much you are willing to spend and the kind of tool belt you want. But, it is important to note that the high-quality leather belts that are made to last for ages and with several pockets and pouches are also the priciest. And so if you want a top quality tool belt with lots of tool storage space, you should be ready to spend a little more. 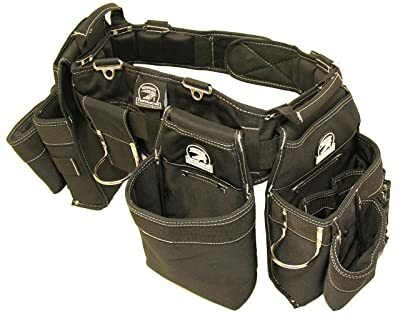 Although there are many companies that make and sell tool belt for carpenters, there are some that are famous for making high-quality products as they have been in the business for long enough to understand the needs of a carpenter. These are the brands that you should buy from as they are also more likely to honor warranty terms. Some of the most reputable carpenter tool belt brands include Gatorback, Tradegear, Occidental, Dewalt and CLC Custom Leathercraft. Every carpenter needs to have a tool belt as it will make it easier to organize the tools and make them easy to access. Also, it saves a lot of time, improves job site efficiency and also helps to prevent tool loss. But finding the best carpenter’s tool belt from the many options out there is even more important. However, this should be an easy task if you keep the simple points highlighted in our buying guide above in mind. And you will also not need to spend a lot of time comparing dozens of products as we also make things much easier for you with our in-depth top 5 carpenter’s tool belt reviews.